2. Deernutz - Because I'm crazy about deer hunting. I'll put it to you this way. I live in MT and would rather deer hunt then elk hunt. 4. Anything that will take me outdoors. 5. Whitetail deer first then Elk, Mule Deer, Grouse, Turkeys you get the point. I got full custody of my boys cause she didn't want them. 9. Pizza/ but I also make a killer ground venison potpie. 10. 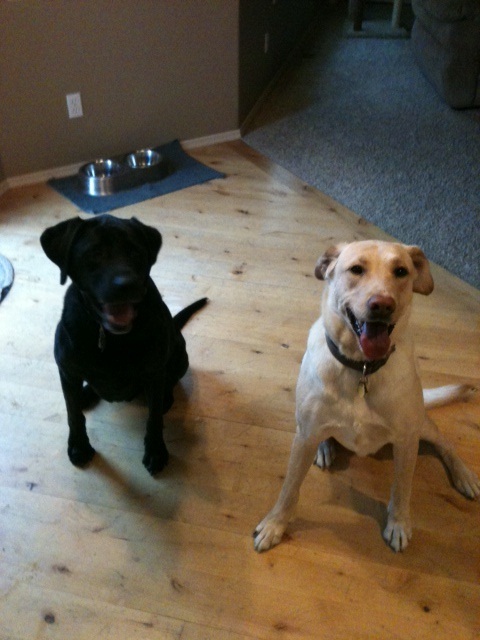 (1) black lab named Gunner, and (1) yellow lab named Kodi both rescues. Oh and I once saw a UFO when I was 12 ice fishing in Northern WI actually 3 at the same time. By the way these are my boys I got full custody of. Last edited by deernutz; 11-26-2013 at 10:12 AM. Part of it is the company I work for and part of my last name, this started when I had AOL as the main internet service. Of course I like the Packers, whether they win or not. I'm a meat and potatoes kind of guy, steaks, that sort of thing, I don't drink a lot of alcohol, lots of water and diet soda, but if you pin me down on a drink, I will say Drambui over the rocks is one of my favorites. I personally don't own any pets right now, we used to have a cockapoo and a yorkie, both had to be put down due to complications of old age. My son who is temporarily living with us right now,has a 45# Husky mix that is a wonderful dog. 2. Creekhobo........I spend a lot of time at the creek and will work for money. 3. North Carolina.....Lived in the same county over 50 years. 5. Whitetail Deer, Fish and a few other critters. Good to see ya around, Mark. Have you killed anymore big bucks? means: sunset, because I couldn't think of anything else at the time. Love me a sunset. 4. Your hobbies/interests: hunting, running, writing, sewing, singing following my two beautiful daughters around on their adventures. 6. Marital status/kids/grandkids/ single, 2 beautiful daughters, they are both graduating this year. one from college, one from high school. 7. What you do for a living or student or retired, if retired what did you do before. I'm a nurse. Going back to school in a few days for 1 1/2 yr to upgrade my nursing training. yikes! 8. Favorite sports team or TV show or both sports team/ would have to be anything my kids are playing on ...Ohio State Buckeyes...tv show is Project Runway and an Australian comedy: The Librarians, hilarious!! Spiders scare me more than snakes. I can't get a pie crust from scratch, but, I can make a mean meatloaf. I like flower gardening more than veggie gardening. I'd rather run a chainsaw than a weed wacker. I'd like to visit every National Park before I croak. I got a tattoo for one of my best friends that died from cancer. I'd rather be in the woods than a shopping mall. I love a Blues concert I take my kids to Gettysburg, Pa. every year. We love Civil War history. I miss my Mom. She passed in October, after 1 1/2 year of suffering with lung cancer. 5. Deer, Rabbit, my favorite is Squirrel, Arkansas, the best rabbit hunting I have done in my life. 8. Dallas Cowboys, Washington Redskins, and Love The Walking Dead. 9. Fried Catfish, anything fried, Fried oysters, Grilled Salmon most anything food. 10. 1 Beagle, 1 beagle/pug mix, 3 mountain cur fiest. 2. Buckman11 - because im a man who kills bucks, and i was 11 when i killed my first. 4. Huntin, fishin, makin calls. 6. Single, dont want anybody slowin down my huntin. 8. TOUCHDOWN KANSAS CITY!!! GO CHIEFS!!! 9. A good venison steak & iced tea. 10. no "pets". i raise boer goats and angus cows. and id swear they where puppies.